Today I had a brief chat on Twitter with the ever amazing Sarah Stanley surrounding a technical piece of her RunRideInspire.com website. Most of it took place behind the scenes through direct message, but in the end I believe it was of assistance. You see part of what Sarah is looking for are Inspire Ambassadors (act quickly by sending an email to RunRideInspire@gmail.com if you’d like to be one). What got me thinking was that there was a domain name intact already, but she was essentially promoting Gmail. Many businesses do this, and I just don’t understand why – whether it’s Gmail, Yahoo, Hotmail or their internet provider. The list goes on. With domain names starting out so cheap now from a place like GoDaddy.com there’s no excuse to NOT have a company branded domain name. In addition to that, even though GoDaddy.com does hosting, you can easily get your email handled for FREE through Google Apps. This is where Sarah and I were at a disconnect. Being that Run Ride Inspire is charity, “every dollar counts” she stated. And I agree. Running a fund raising initiative of my own (I need to update it this week), I know that every penny does truly count. I’ve been using Google Apps with my domain names for a few years now and have been fortunate enough to never spend a dime on the amazing service. In fact I just recently switched two separate clients over to the service. I could go off on why it’s a great choice, but there’s already plenty out there on Google as to why it’s a good choice…and even why it’s not. I was on my iPhone but determined to help Sarah out I did a quick search in Safari. It started to become clear as to why she didn’t want to use the runrideinspire.com on Google Apps for fear of having to pay $50 per user per year. Typical marketing. On the initial screen, you’re presented with two options: Business or Education. On the following screen they present the nice, pretty blue button to begin a free trial. But if you look closely enough, there are some boring text links under the button. This is in fact where the hidden gold is in using Google Apps with your own custom domain name…for FREE. 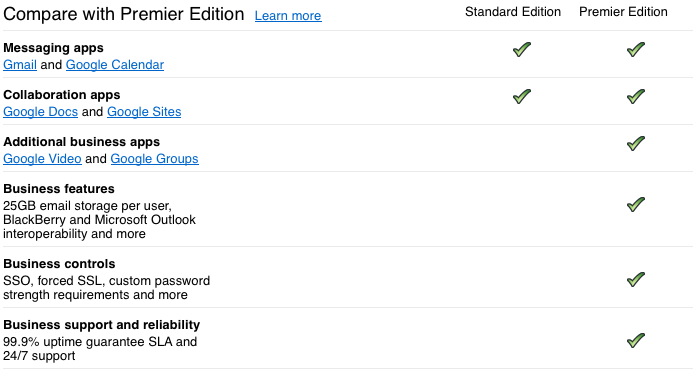 When comparing the Google Apps Standard Edition (i.e. the FREE version) to the Premiere version, there’s not a lot of difference that the standard, average user would ever want or use. You still get Gmail, Calendar, Docs & Sites. I’m up to about 7GB of storage space in my App Mail account of which I’ve used about 50% over the last few years…and my business handles lots of large files through email. The rest of the ‘business’ features, controls, support and reliability aren’t really required. I use my hosted Gmail with my iPhone without issue. In fact, it works better then my normal Gmail account does…so there! As much as I love my Shannon Poole (who yes, does love me), I’m happy that Sarah at least sees some value in me. 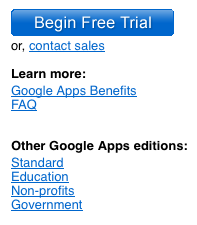 So now my question to you is do you use Google Apps and if so, which version? Is Sarah making the right choice by moving (I hope) her email from Gmail to her own domain name? Let me know in the comments. Entries (RSS) | Comments (RSS) | 54 queries. 0.465 seconds.